Like many buildings we have built, it is not too long before we get a phone call from our customers requesting another building as did our Vashon Island Washington customer. 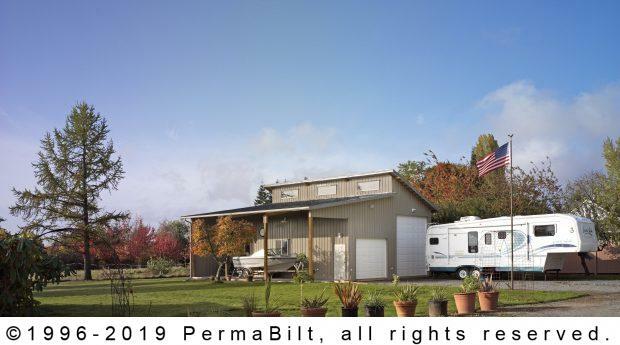 In the process of selling their home and moving to another location on the island, our PermaBilt® Building Representative met at their residence to go over their new site and ideas for their next building. What our customer wanted was a garage to house their car and RV but also a cover for easy access to their motor-home. In reviewing several different designs, what they settled on was a daylight building with its unique look and feel. In capturing the afternoon sun, the daylight garage took advantage of natural light. The upper eave uses the sun’s rays to light their garage. They also had a lean-to attached so they could pull either their RV or boat under cover quickly and easily. When complete and ready to move in, the customer was as pleased with building #2 as they were with their first.